Dr. Arden’s many seminars and workshops focus on optimal brain health for the general audience, and professional workshops on neuroscience and psychology, with an emphasis on neuroplasticity and neurogenesis, with psychoneuroimmunology, epigenetics, psychotherapy research, mindfulness, nutritional neuroscience and social intelligence. Dr. Arden gives seminars and workshops throughout the United States, as well as various countries such as Norway, Australia, the UK, New Zealand, Ireland, Bulgaria, Singapore, Armenia and South Africa. Simply put, you cannot change how you think and feel without changing your brain. During the last few years several magazines published feature articles on the new advances in Neuroscience. Neuroplasticity, Mirror Cells, Neurogenesis, and the “Social Brain” have become terms discussed on radio shows and newspaper articles. These findings have dramatically affected our understanding of what occurs in your brain. If you’re like most people you’ll want to learn more about how these developments can be applied to your practical life. 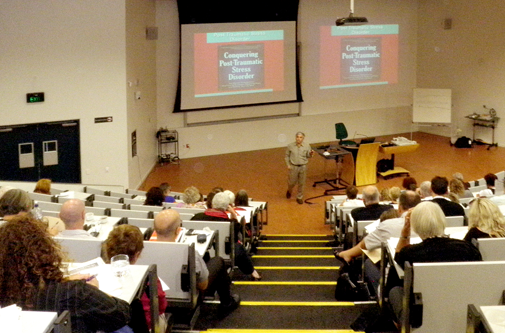 In addition to his live speaking engagements, CDs and DVDs of his courses are available here.